Twenty Eight THOUSAND Four Hundred Eight! Is this number large or small? That depends on what you are comparing. 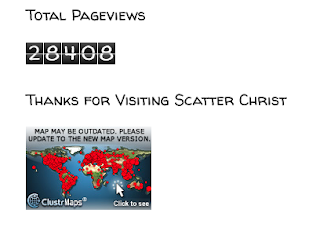 This is the number of page views on Scatter Christ since 2008.
but very large considering Scatter Christ has never advertised or officially published this blog. Because cluster maps has changed their format - the number is back to zero. Will you join us in Scattering Christ together? I met this homeless lady in the green jacket in 2005 during The Church at Brookhills Extreme Graceover. She had been sober and at a shelter 55 days. During this weekend, she ate at Pizza Hut and Fish Market, got new PJs, received a new haircut and new clothes. She was very funny and quick witted. I posted about DEllis (HERE). Tonight as I had dinner with another one of the homeless women almost 10 years later, we discussed DEllis and her whereabouts. WB asked me if I still had the necklace for her. I DO, let's find her. I pulled out my smart phone and googled for a phone number, knowing she left Birmingham for Pensacola, Florida to live with her father. My heart sank when what appeared was her obituary! She passed away several years ago. The above picture also appeared in an advertisement for Help for the Homeless! Christ, family, church and friends are such a blessing that so many of us take for granted each day!